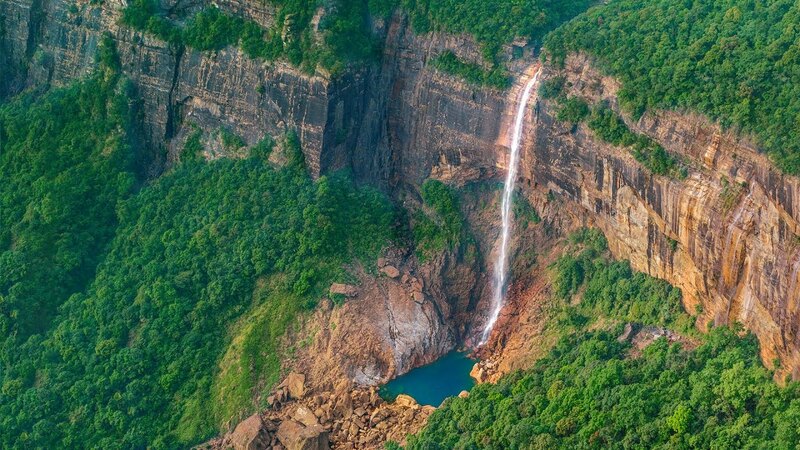 Cherrapunji is tallest plunge waterfall in india , Which is one of the wettest place on earth .Thw Waterfall is almost as if it jumps down like the lady who is responsible for its name. There is one story goes – Likhai – the lady was a widow with a child till she married again. The jealous husband cooked the child and fed her the food. Realising what he had done, she ran and plunged down the cliff. While you can only see the waterfall from afar, it is enough for you to appreciate the stormy stream that emerges between the greens and falls over . Three different streams falling down a cliff to form a natural swimming pool – that is what you get when you visit Triple Falls. The surrounding forest reserve is a great place for birdwatchers and trekkers while the pool with its cool waters pleases all. Remember to pack a picnic basket for you might just want to spend an entire day here. If you are in Pelling , Sikkim than you cannot miss a chance to visit Kachejunga . Fall Which originates from kachejunga mountain Highest peak in the world . If your are an adventure lover you can do rope activities here . Till the 90s the kanchejunga falls was not known to people and remained untouched and now it’s one of the major tourist attraction of sikkim .